Sat, Sep 8, 2018, 12:24 pm SL Time, ColomboPage News Desk, Sri Lanka. Sept 08, Colombo: The Sri Lankan government under the Samurdhi funds program has taken measures to provide benefits to 150,000 more families and the inaugural event on providing Samurdhi benefits to new families was held at the auditorium of the Polonnaruwa Royal College yesterday (07) under the patronage of the President Maithripala Sirisena. Speaking at the event, President Sirisena said the government has entered into a sustainable development approach which would eradicate the dependent mentality, enabling the people to build a nation which can stand on its own feet. The Samurdhi program benefits another 150,000 families who were deprived of the privilege although they were eligible. This is conducted under the Ministry of Social Empowerment and Welfare under the theme "Secure Sri Lanka-Strong Community" towards empowering Sri Lanka as poverty free nation. 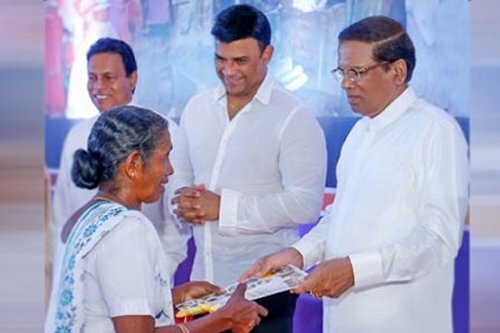 President Sirisena further stated that the low income families may receive this kind of benefit and that he is content with it while the determination of those people must be to become self-sufficient free of this eternal dependent mentality. The President said that the government has taken steps to conduct programs including loan schemes and when one becomes self-sufficient that paves way for the development of the entire country. Expressing his views regarding the development program of the country, the President said that finance is not a problem for the development activities. He said that as a result of wining the international cooperation by the government during the past three and half years, at present the assistance of the international community is forthcoming for the development process of the country. President Sirisena further said that during the meeting he held with the international donor agencies which provide assistance to Sri Lanka, they pledged to further increase the assistance in the future. If the people engaged in the political sector as well as in the public service fulfill their responsibilities and duties properly, there will be no difficulty in moving towards the development of this country, he added. President Sirisena said that everyone should unite without political interference to develop the country while eradicating the poverty of the people. Under this program 3800 low income families in the Polonnaruwa district will receive new Samurdhi benefits. The President symbolically handed over the document in this regard to 21 persons covering all the divisional secretariats divisions. Minister P. Harrison, Deputy Minister Ranjan Ramanayake, Ministry Secretary Shirani Weerakoon, Polonnaruwa District Secretary S.P. Abeywardena, Additional Director General of the Samurdhi Development Department Nimal Kotawalagedara, religious leaders and others participated in this event.